Wired Motor & Function Decoder that fits many N and HO Scale Locos. Configurable Pulse Function available on all function outputs. Function Mapping for custom function setup. Digitrax LocoMotion® System-Your locomotives look like the real thing. Scaleable Speed Stabilization (Back EMF) with simple setup & 256 level resolution. Program CVs using any Digitrax Compatible Control system without havingto buy any extra equipment. 2 Digit and 4 Digit Addressing. Basic, Advanced & UniVersal Consisting. SuperSonic motor drive for silent operation. Decoder Reset CV with or without speed table reset. Transponder Equipped ready for transponding on your Layout. Motor Isolation Protection helps prevent damage to your decoder. Automatic Analog Mode Conversion when running on DC layout. Decoder Lock for individual programming of multiple decoders in one loco. Decoders with wires provided for hooking up the decoder in the locomotive. If wires are not provided for hooking up functions, solder pads are provided to allow you to access those functions by adding wires. 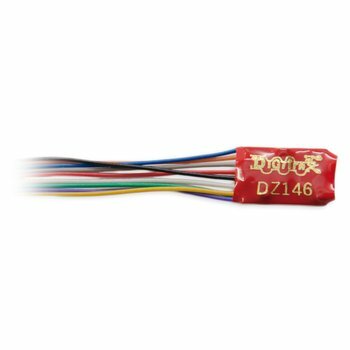 Note: DH82 & DN92 decoders, some of the very first decoders produced by Digitrax used a different wiring color code. Please check decoder spec sheets for the wire colors that were used with these decoders. Turn functions on and off. Head lights and tail lights are automatically reversing unless you make them independent. All function outputs have FX generators for prototypical lighting effects and have qualifiers for FX effects and qualifiers for standard on/off functions. All Digitrax Series 3 decoders have FX3 type functions. FX3 decoders offer full function mapping so you can choose which function (F0-F12) controls each function lead. FX3 decoders offer master light switch capability. FX3 decoders offer qualifiers for FX function operation qualified by one of the following: the loco's direction of travel, whether F0 is on or off, loco direction and F0, or whether the loco is moving or not. These qualifiers are also available on function outputs that are used as standard on/off functions. Motor Isolation Note: FX3 decoders have motor isolation protection. If the decoder senses that the motor is not isolated, it will not run the motor. In this case, you will be able to control the loco’s functions but the motor will not work. Here is an explantion of how the CVs that control FX3 effects work. Most modern Digitrax systems do not use hexadecimal format but it is provided here in case you need it for older systems. Decoders with FX3 features have 8 user configurable, independent special effects generators. These are set up by programming CV values as described below. If your decoder is not a “series 3” decoder, please check the spec sheet to determine which type of functions it supports. FX3 functions incorporate FX generators with additional dynamic and static qualifiers. FX3 functions are fully remappable so they can be controlled by any function key on your system. A master light switch can be set up to turn off all lights on a locomotive. Functions associated with advanced consists can be controlled, too. 1. Each function output has an FX3 control CV associated with it. Using TABLE IVa below, determine which CV you need to program to set up an FX3 feature for the function output you are working with. For example, if you want to set up an FX feature on your forward headlight, you will use CV49 to control the FX3 feature for the lamp attached to F0F. Some decoders do not have function output wires attached. See the specific decoder instructions to determine which "pad" on the decoder controls each function. Use thin wire or wire saved during previous decoder installations to solder function output wires to the pads associated with the function you want to use. NOTE: Decoders with FX function generators use different CVs to control function outputs. Click here to go to FX page. CV53 & CV54 are not used for FX3 control. 2. Each FX3 effect has a CV value that generates the effect you want and controls how the effect works with respect to locomotive direction and the head light (F0) function. The FX3 CV value is made up of 2 digits. The second digit determines which FX3 effect will be generated. The first digit determines how the effect will work with respect to the locomotive direction, the head light and other functions. Use TABLE IVb to determine the second digit and Table IVc to determine the first digit of the FX3 CV value to program into the CV selected in step 1. TABLE IVb: The Second digit of the FX/FX3 CV value determines which FX3 effect will be generated. TABLE IVc The first hex digit of the FX3 CV value determines how the effect generated will behave. For example, two strobe lights can be set up to flash alternately by setting one to phase A and the other to phase B. The strobes can also be set up to be on when the loco is moving forward and off when moving backward. 3. Program the FX3 CV value from step 2 to the FX3 CV identified in step 1. If you are using the PR1, an FX set up section is available where you can just "point and click" to set up the effects you want to use. The software lets you select which function output and which FX feature you want from a menu so you don' have to use the tables above to determine which CV or CV value to use. 4. For FX3 decoders, you can set up as many as 8 function outputs. All FX3 outputs can be set up with FX3 effects. 5. If you want any function output to remain a simple on/off output, leave it programmed to the factory default of CV value 00. CV62 lets you control the rate and keep-alive brightness for each FX3 effect you set up. The CV value for CV62 is made up of 2 digits, the first digit and the second digit. The second digit controls the rate of the FX3 effects programmed. This value should be between 0 and F. A value of 0 gives a fast rate and a value of F gives a slow rate of operation. We recommend you start with a 4 and adjust it up or down until you get the effect you are looking for. If you are using the ditch light effect in conjunction with F2, CV63 lets you set up a hold over time to control how long the ditch lights continue to blink after F2 turned off by releasing the key on the throttle. Remember that F2 is a momentary key on most Digitrax throttles that will keep function 2 on as long as you hold the key down and then turn function 2 off when you release the key. This allows the ditch lights to be on steady during regular operation and to begin alternate flashing when F2 (usually the horn) is activated and to continue flashing alternately for a predetermined length of time after F2 is released; just like the prototype. A value of 00 yields no hold over time, a value of 40 yields a realistic time of about 5 seconds. A value of 255/xFF yields about 20 seconds hold over time. Any function output on the decoder can be set up for any FX3 effect by programming its associated FX3 CV to the appropriate FX3 CV value. For example, if CV52, the FX3 CV for F2, is programmed with an FX3 CV value of 002/x02, the violet F2 function output will be a Mars light when F2 is turned on for this decoder address and the decoder's direction is forward. To set up two alternating double pulse strobes on the green and violet function outputs controlled by turning on both F1and F2, program CV51 to a CV value of 037/x25 and program CV52 to a CV value of 053/x35. This is an example of using the alternate effects phases A & B. For FX3 decoders you have 8 FX3 generators available to use with your function outputs. When an FX3 decoder output is set up for static on/off operation (no FX3 effect), you can use static qualifiers to customize the operation of the on/off function of that output. In this case, the second digit of the FX3 control CV will always be 0 to set the decoder for static (no FX3)function operation. The first digit is determined by the following table according to how you want it to work. Trying to program a decoder for FX3 when the decoder does not support FX3. Be sure the decoder you are programming has FX3 features. Digitrax introduced FX3 in 2002 in the “series 3” decoders. Digitrax introduced FX in the summer of 1995 in all of its premium decoders so if your decoder was made before then it does not have FX capability. FX & FX3 decoders use different CVs for controlling the function outputs of the decoder. FX3 effects don't work as expected. Review the qualifiers you set up for the effect. For example, if the effect is set up to come on only when F1 and F0 are active and the loco is headed in the forward direction, be sure you have met those conditions. For FX3 decoders F0 can be used as a master light switch to turn off all lights in the locomotive when F0 if OFF. To do this set up all functions qualified to be on when F0 is on and off when F0 is off. See Table IVc above and use 4, 5 ,6, 7 ,E, or F as the first digit of the FX/FX3 control CV to enable the master light switch on F0. Over the years as technology advanced, Digitrax has added more and more features to our mobile decoders. Also, over time, the industry standards and uses of come CVs have changed. Each of our decoder web pages includes a link to a specification sheet for that particular decoder so that you will know which CVs are used for which features in that particular model. Digitrax uses series numbers to let customers know which feature set is part of a particular decoder. The fifth character of each mobile + function decoder part number is the Digitrax series designator. For sound + motor + function decoders we typically use the sixth character as the series designator. There are variations in a few part numbers. FX3 outputs optimized for both LED and bulb applications. FX3 outputs have configurable pulse available on all outputs. Improved Scaleable Speed Stabilization (Back EMF). Premium Series 6 Decoders have Scaleable Speed Stabilization (Back EMF) and usually have more than 2 available function leads. Economy Series 6 Decoders do not have Scaleable Speed Stabilization (Back EMF) and usually have only 2 available function leads. Sound decoders available with either 8 bit standard or 16 bit premium sound. Sound decoders configured for 8 Ohm speakers. Allows for longer sound fragments. Available in either standard 3 or premium 4 voice versions. Scaleable Speed Stabilization (BEMF) optimized for sound operation. *Some very small/specialized Series 6 decoders do not have connections for PX modules due to space constraints. Sound Bug Compatible: Series 5 Digitrax Decoders add the ability to add sound to regular mobile decoders with Sound Bug. Some Series 5 decoders have sockets for simply plugging in the Sound Bug while others require soldering to wire the Sound Bug to the decoder. Most are mobile, sound and function decoders, some are sound and function only decoders. Digitrax decoders have standard or configurable strobe function outputs.